As a fan of cryptocurrency, you’ve probably heard the terms “Proof of Work,” “Proof of Stake,” and maybe even “Proof of Burn” before, but what do they really mean, and what is a “proof,” anyway? Without getting into too much technical detail, we will explain each concept one at a time so you can have a better understanding of what they refer to the next time you see it in a potential investment. This week we explore the advanced form of Proof of Stake known as Delegated Proof of Stake. 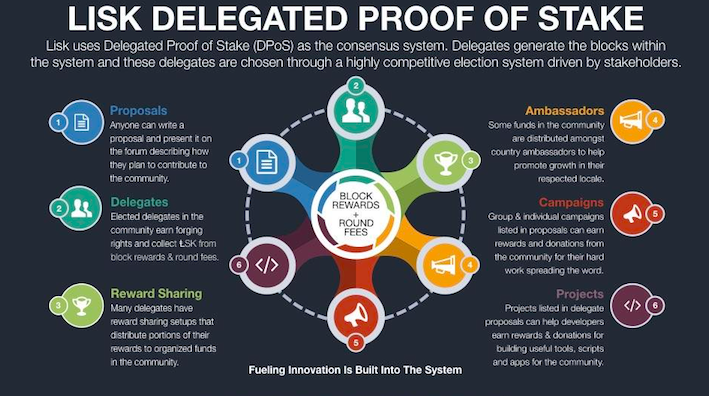 Like Proof of Work and Proof of Stake, Delegated Proof of Stake (DPoS) is a blockchain security mechanism, otherwise known as a “consensus algorithm.” At its essence, DPoS uses a real-time voting system where coin holders cast a number of votes equal to the number of coins held, combined with a reputation system to achieve network consensus. As with PoW and PoS it is designed to ensure that a cryptocurrency network can process transactions and validate the ownership of coins without the need for a central authority, however, its advantage is that it is a highly democratic system that allows for any coin holder to have say in the future of the network. DPoS represents an evolution step away from classical PoS and was also developed in order to reduce the costs and inefficiency associated with the consumption of electricity typical of Proof of Work (PoW) systems used by the likes of the Bitcoin and Ethereum Networks. The DPoS system was implemented for the first time with Bitshares (BTS), developed by Daniel Larimer in 2013, who sought to create a more energy-friendly alternative to PoW while also making improvements upon the original PoS system. With original PoS, the entire network is required to validate incoming transactions, whereas with DPoS this task is performed by a limited number of “delegates” which acts as nodes capable of adding transactions and blocks on behalf of the rest of the network. These delegates are elected by the entire network using a system of democracy that represents a consensus of participants. The delegates, which are compensated for each transaction and/or block added, ensure the safe validation of every network transaction. Their “weight,” or importance, within the network is determined by the combined number of tokens owned by those who vote for the delegates. If the delegates confirm too many unwanted transactions then their behavior can be punished by the community by voting the delegated nodes out of their authority. What does this all mean, simply put? It means that each network participant has the right to vote on delegates to add transactions and blocks on their behalf, and if they are not satisfied with the performance of a delegate, they can vote for new delegates to take their place. With most DPoS implementations, only the top portion of delegates will actually be paid for their contributions, thus delegates are always battling to gain the influence of more token holders. It also limits the number of entities that are capable of directly producing a block, which are determined through DPoS election processes. The DPoS system has proven itself to be a popular blockchain mechanism because not only can it remove “bad actors” from a network but encourage competition and the addition of valuable new members. These two types of democratically-elected, specialized functions serve to not only help secure the Bitshares network and keep it free from centralization but also allow it to evolve over time, giving it a certain degree of flexibility and competitive edge. In addition, DPoS helps mitigate the risk of adverse events such as “51% attacks” in that shareholders (stakeholders) cannot pool their resources together to cast all their votes for the same delegates or witnesses. Lisk’s implementation of DPoS is different from Bitshares in that not only are delegates assigned the roles of verifying transactions and adding them to the blockchain but they can also vote on ways to solve problems regarding network consensus, and that there are a fixed number of delegates at all times (101 active delegates). Each delegate is assigned one particular time slot (every 101 blocks) in which they are responsible for generating a new block with up to 25 transactions. If a delegate does not forge a block during its designated slot, it will be bypassed and will not receive its share of newly-minted LSK. To forge a block, the node associated with the delegate inserts transactions into the upcoming block, signs it, and broadcasts the new block to the network. Upon the block reaching the network, the next delegate in order will begin to forge in their assigned slot. Other popular implementation of DPoS include EOS (EOS), Steem (STEEM) and Ark (ARK). Have any questions about DPoS whose answers were not covered in this article? Feel free to let us know in a comment below and we’ll be sure to get back to you as soon as we can!